Lists are up & Name of the day! Sophia means “wisdom” in Greek. It was also the name of an early saint who is thought to be mythical. The saint supposedly died of grief after her three daughters were murdered for their beliefs. These legends probably were told as a result of a medieval misunderstanding of the phrase Hagia Sophia (“Holy Widsom”).. 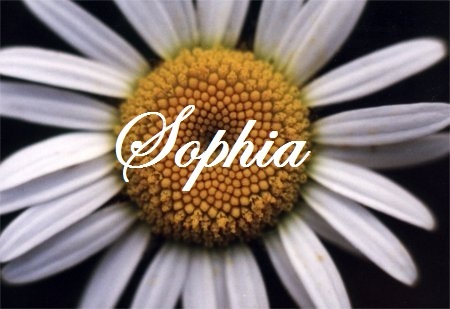 The name Sophia was very popular in European countries during the middle ages and it was popularized in Britain by the German House of Hanover when they inherited the British throne in the 18th century. It was the name of characters in the novels ‘Tom Jones’ (1749) by Henry Fielding and ‘The Vicar of Wakefield’ (1766) by Oliver Goldsmith. Due to popular culture the name may be used moreso now because of celebrities and the such. Sylvester Stallone’s daughter’s name is Sophia and widely popular amongst teens Farrah Abraham of 16 & Pregnant/ Teen Mom named her daughter Sophia. Sophia has a great meaning so in my opinion, it should be popular! In 2010’s SSA list Sophia ranked #2. As you can see, it is a VERY popular name which may throw some peope off of using it. In 2009’s list it was #4, in 2008’s list it was #7, in 2007’s list it was #6 & in 2006’s list it was #9. In 2005, it was #12 so it has been in the top 10 for the past 5 years and we’ll have to see what it ranks in 2011’s list but I predict it’ll be around the same at 2010’s. In 1947 Sophia ranked #847! As you can see.. it just kept rising after that. 4 Responses to "Name of the day: Sophia"
Sophia Lynn is a gorgeous combo, and it’s great that it has significance to you. I find all great combos have higher meaning when used to honor family members or something special.